What follows is the long saga of what I thought would be a simple and quick home improvement project. But I’m proud that I did it all myself. When we moved into our house, we had built in bookshelves and cabinets installed to either side of the fireplace. 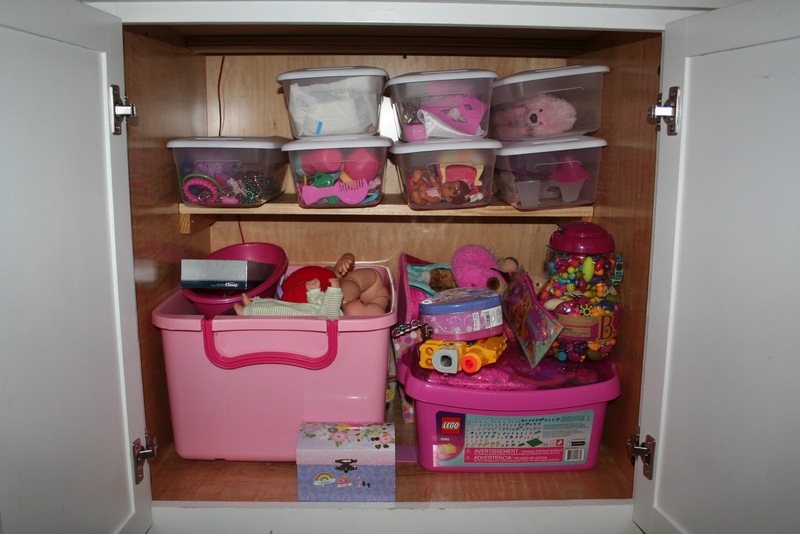 They cabinets in the bottom have always been a great place to store a lot of the toys. They each have a cabinet. I’ve gone through several different ways of organizing things but in the last few months, I decided they needed a shelf to utilize a little more of the vertical space. I figured I could probably tackle this project myself and some day around New Year’s I went to Lowe’s and picked out my shelving and had the nice man cut the pieces to my measurements. The first problem is that the 1×10 boards that I purchased were not really 10 inches wide. More like 9. But I had the ledger boards for support cut to 10 inches. They were an inch too long and I didn’t want them sticking out from under the shelf. Also the shelves were just a bit too snug when I fit them in the cabinet. I did a bunch of sanding and fitting and refitting until I thought they were good. Then I put some satin finish polyurethane on my shelves. The ledger boards sat there for quite a while, staring at me, waiting for me to find a solution for them. I was hoping I might see my neighbor out who could just take an inch off with his saw really quickly. No luck. It took a couple weeks but it finally hit me that the simplest thing to do was to go back to Lowe’s and just buy another $2.50 1×2 and have the man cut it 9 inches instead of 10. Oh, except this nice guy informed me that they can’t do cuts less than 12 inches. That other guy must have been breaking the rules for me. Plan B – I bought a miter box and saw. I came home and hacked that 1 inch off those 4 ledger boards in about 10 minutes. Kind of proud of myself but it cost more to buy the miter box & saw than it did to just buy a new piece of wood. But then it got cold and I didn’t feel like adding the polyurethane to my ledger boards. For a couple weeks. It warmed up and I finally finished the polyurethane part. Time to screw those ledger boards in and set up my shelves. Except I guess the poly added a little too much width back to my shelves and they were too tight again. Or I never sanded them enough in the first place. I got the circular saw out. Told the kids to cover their ears. Made some horrible cuts…one was very crooked and the other I wasn’t holding the saw level and the blade didn’t go through the wood all the way so I finished it with the hacksaw. Jack asked me why it smelled like things were burning. I got a little short with him. They were ugly, which was kind of a disappointment. But then I put them in the cabinets. They fit and no one can see how ugly they are. Case closed. Or cabinet closed. Or project finished. The end. 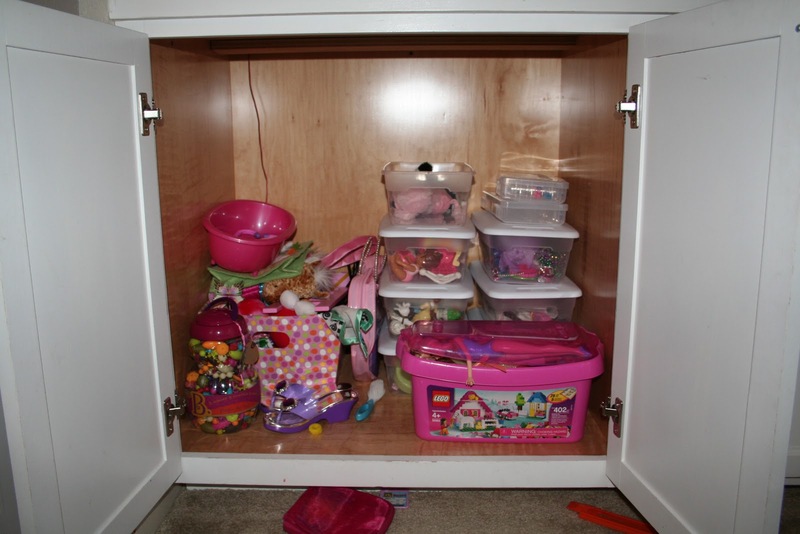 This is Casey’s cabinet beforehand. Not too bad. I bought a bunch of $1 shoe containers just after Christmas to organize all her little things…dolls clothes, doll accessories, princess shoes, etc. 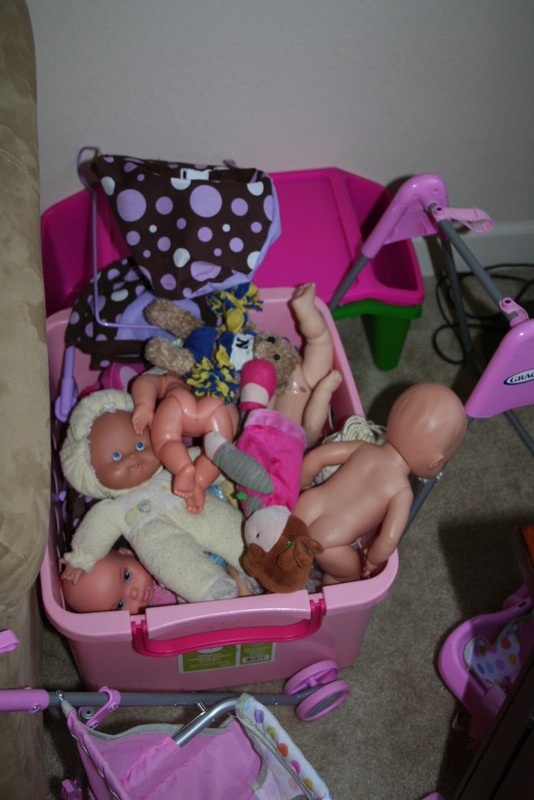 But she also had this bin full of (mostly naked) dolls that didn’t fit in the cabinet. The after – It fits a lot more stuff in there. It bothers me a little that the shelf is slightly too narrow for the four shoeboxes to fit perfectly across. I can’t really make the cabinet wider though. Although maybe dollar store has slightly narrower boxes. 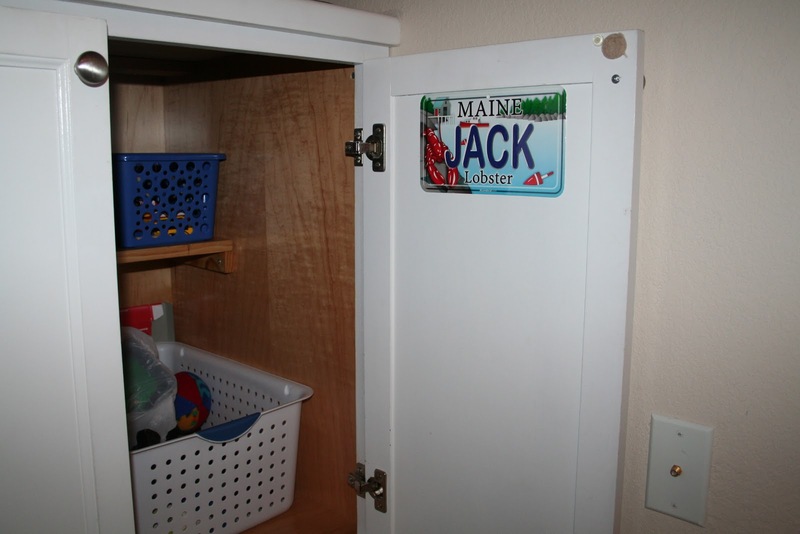 Jack’s cabinet wasn’t really in need of the extra space. 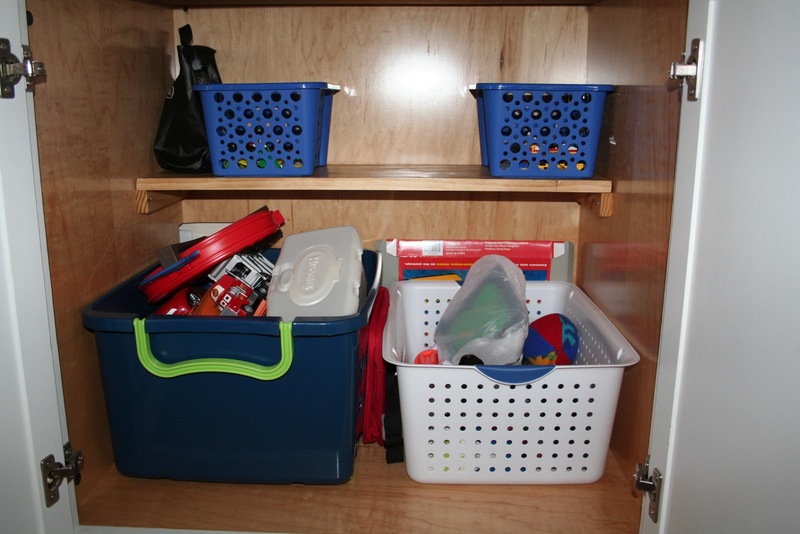 It basically looked like this but without the shelf. But now it looks nicer. And another Aha! moment. 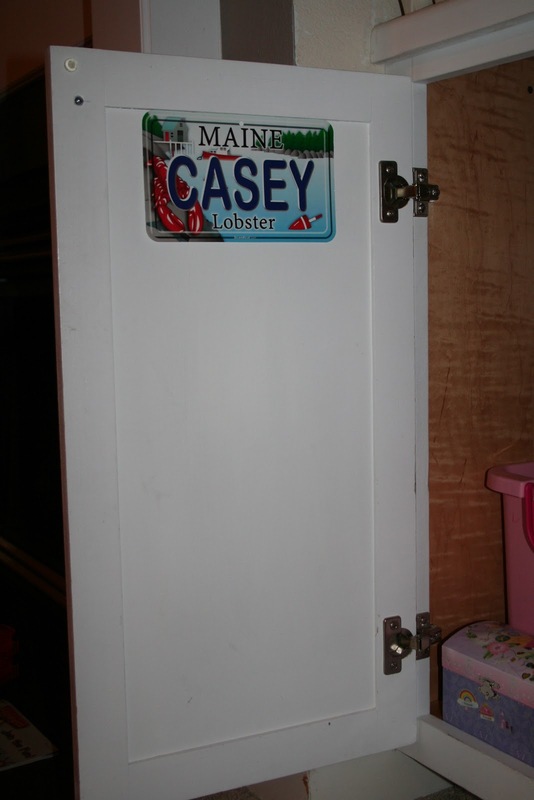 These cute little license plates have been floating around inside the cabinets for years. Why did I just figure out that I should stick them on the cabinet doors now? But I’m glad it hit me and I like it! Thus ends the long saga of my shelving project. It really only took a couple hours of total time, but I managed to spread it out over a month or so and add some obstacles to make it more exciting. And I’m very happy with the final results. 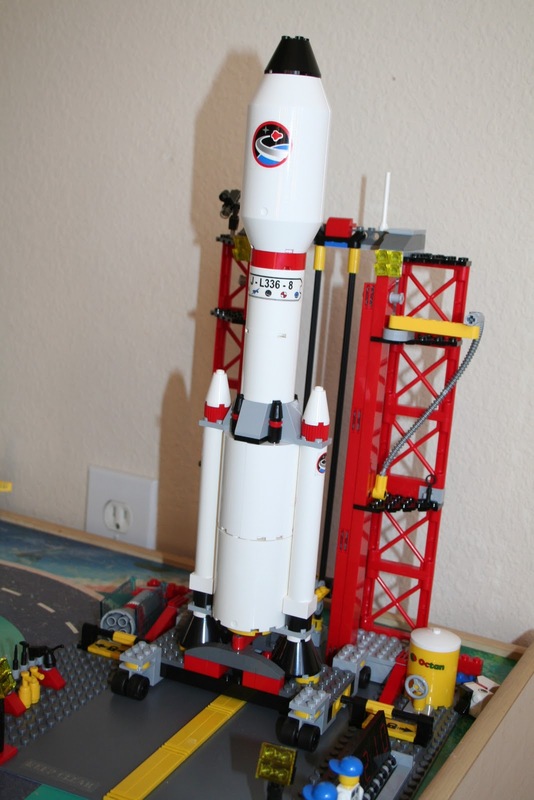 I may have mentioned that we have a few Legos lying around the house (here). Christmas added a few items to the collection and I was getting tired of all the houses, spaceships, starfighters, ninjas and pizza shops sitting on the built-in bookshelves. It added a cluttered feel to the living room. When they were all lined up neatly it didn’t look too bad, but when I moved them all off the shelf during Christmas decorating I realized how much better it looks without them. I decided that the kids needed a Lego table. They were setting up cities in the middle of the living room floor and it was getting dangerous to walk into the living room in bare feet. 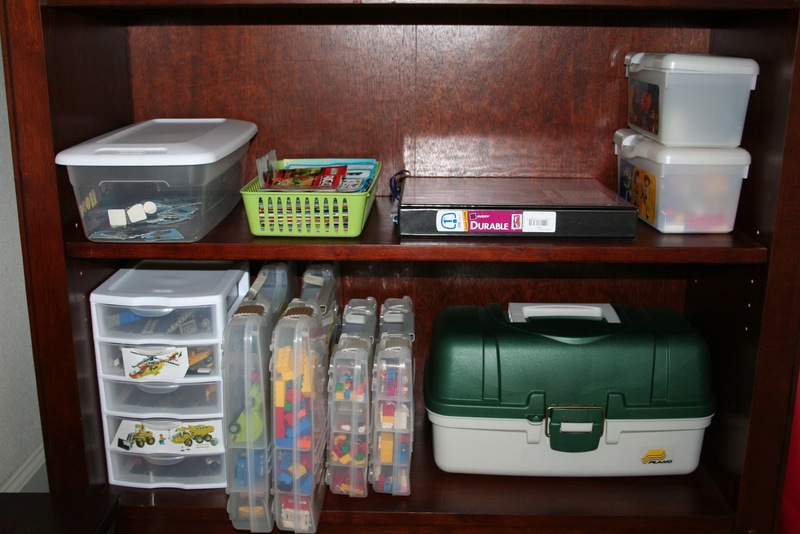 I’ve probably already invested more time thinking about, planning and executing my Lego storage solutions than most people but I did some more internet research and thinking about the best way to make a Lego table. All my plans revolved around some surface onto which I could glue a bunch of Lego base boards. I have an extra coffee table but I decided that wasn’t big enough. I thought about buying an unfinished table top at Lowe’s and gluing the boards on that. It could be shoved under Jack’s bed to move it out of the way or it could just be placed on top of an existing table. I looked into buying a used (bigger) coffee table on Craigs List. I thought about gluing boards onto their train table too. 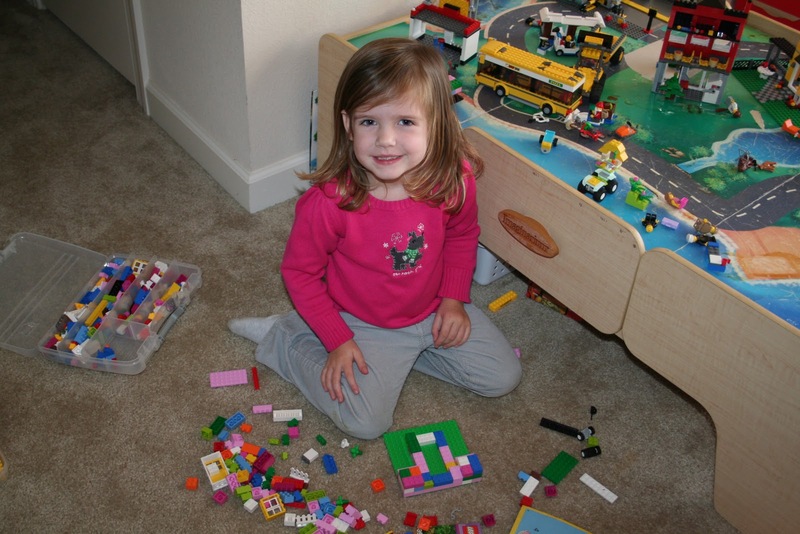 I searched Pinterest for “lego table” and saw all kinds of cute solutions. I thought about all this for a good week. Then the Legos all over the living room got to me one day and I tentatively asked, “Do you guys want to turn your train table into a Lego table instead?” It was an enthusiastic response from both of them and we got to work. Actually, I got to work and they got to playing. The train table is upstairs in our playroom and it’s not really used all that often as a playroom. 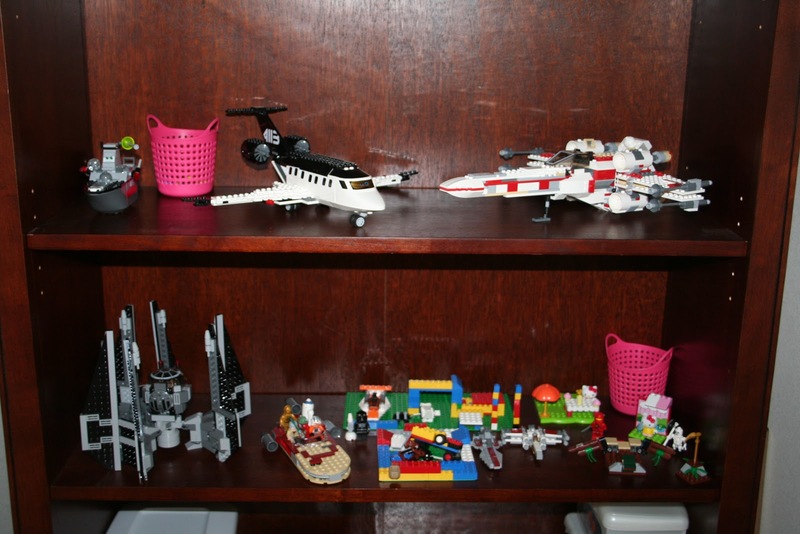 I was somewhat afraid that if I put all the Legos up there, they wouldn’t play with them. But I reminded myself that we could always move them back downstairs if that was the case. Nothing was permanent. The best part about this train table is that we bought it for $25 off Craigs List 2 1/2 years ago and that’s a bargain for a train table that’s held up as well as it has. 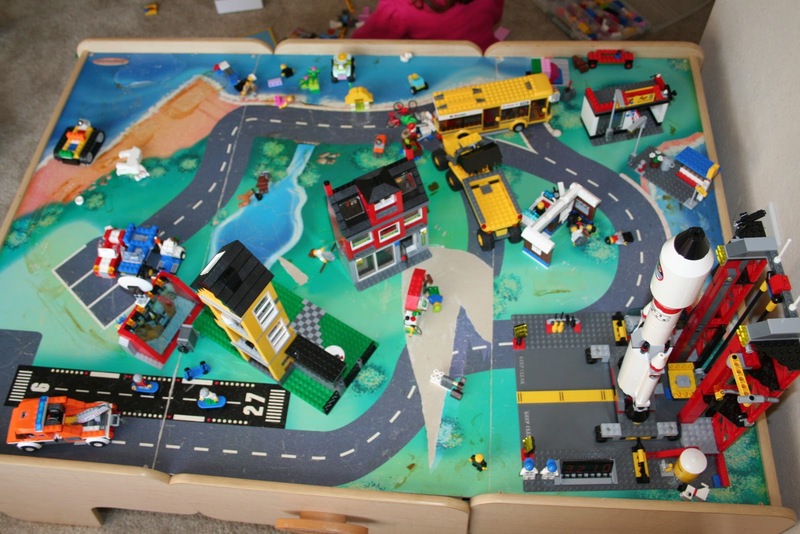 Now that it is living it’s second life as a Lego table it makes it even more of a bargain. I think Pat is no longer cursing me for sending him 30 minutes away to the “country” to buy it. The original owners of the train table told us that train table had two sides to the top surface but that the one with roads, water and land was a little beat up. We’ve had it on the plain green side since we’ve owned it. We decided to flip the boards back over and the kids immediately arranged their buildings and space centers and cars within their new city. 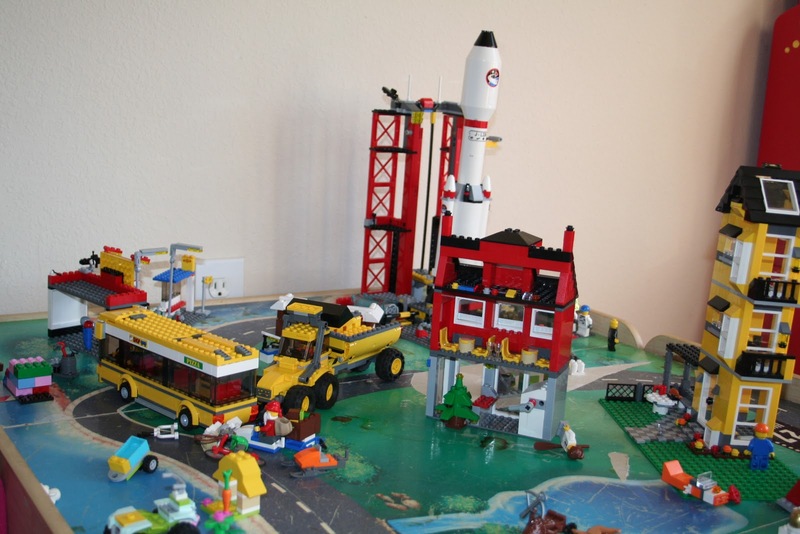 It’s been almost two weeks since we created our own Lego City up their and the kids have loved playing up there. Of course it requires that I spend a little more time up there too but that’s actually been good for our laundry since the laundry room is beside the playroom. I fold and they do city things. Oh, and it turns out it’s totally not necessary to glue any Lego base boards down onto the table. Their bigger sets already come with bases and they enjoy just having a flat surface on which to drive the their cars. 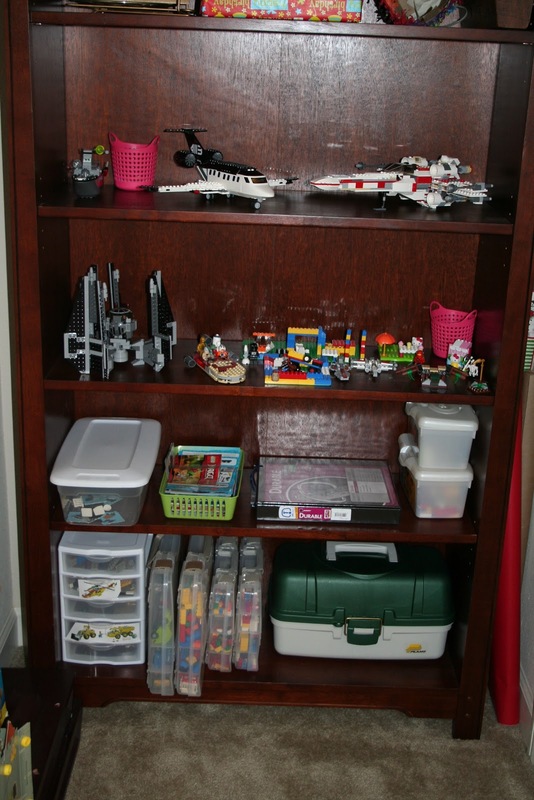 There is also a big bookshelf in the playroom and it has more than enough storage for the sets that are rotating out of “city” duty, the Star Wars Legos that occasionally attack the city, their extra blocks and instructions. Casey is also starting to create her own structures and a few days ago she put something together all by herself by following the directions. I was very impressed.